Hallow’s End :: More Treats for your Time! 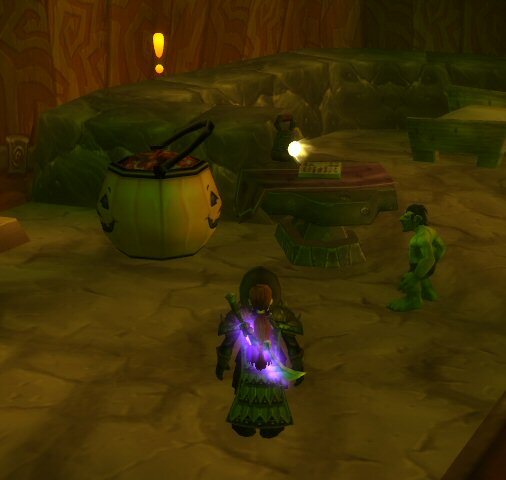 With all of the items you now need to complete Hallow’s End dropping from the Handful of Treats, plus the Tricky Treats being used as currency to buy any additional items you might need, getting every Bucket is a priority, potentially saving you the effort of having to purchase items that can drop randomly. Plus, at L85, the gold is not unreasonable. I made 240g on my collection round, picked up three of the four sweets I need for Hallow’s End Treats for Jesper, plus completed an Arathi Basin and snagged G.N.E.R.D Rage to boot. All the Eastern Kingdom buckets yieldes 64 Tricky Treats, though bear in mind you may get more or less than that number. 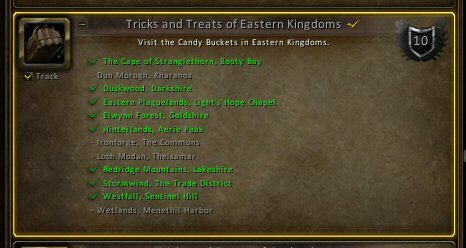 Remember, with no Trick or Treat dialogue available from Innkeepers this year there will be no hourly pickup of items, and these Buckets are a one-use deal per year. Collect your treats wisely! [*] I know that there’s at least one Bucket located by neither of those things in the Cataclysm achievement, but it’s a decent rule of thumb to locate them.